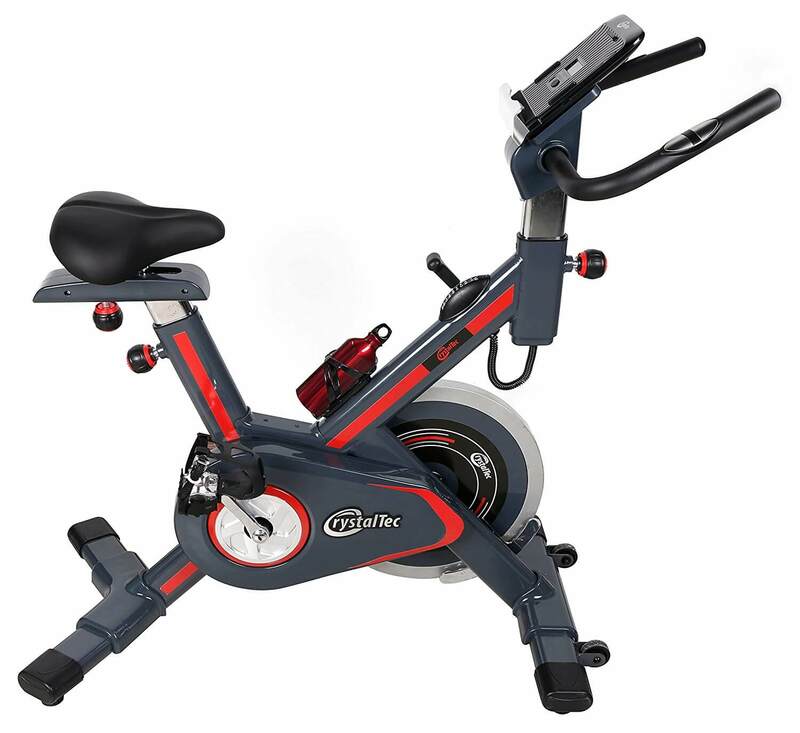 JLL IC400 Elite Premium 20kg Flywheel – Crank System – Digital Screen – Adjustable Seat – Heart Rate Monitor – 130 x 45 x 134cm High end VIEW PRICE HERE! CrystalTec 8 Resistance Settings – Digital Screen – Heart Rate Monitor – Bottle Rack And Bottle – 117 x 64 x 99cm – 32 kg High end VIEW PRICE HERE! York Fitness Active 110 4kg Flywheel – Crank System – 8 Resistance Settings – Hand Pulse Sensors – LCD Display – 25kg Mid range VIEW PRICE HERE! We R Sports 4.5kg Flywheel – 8 Resistance Settings – LCD Display – Hand Pulse Sensors – 90 x 54 x 139cm – 27kg Mid range VIEW PRICE HERE! 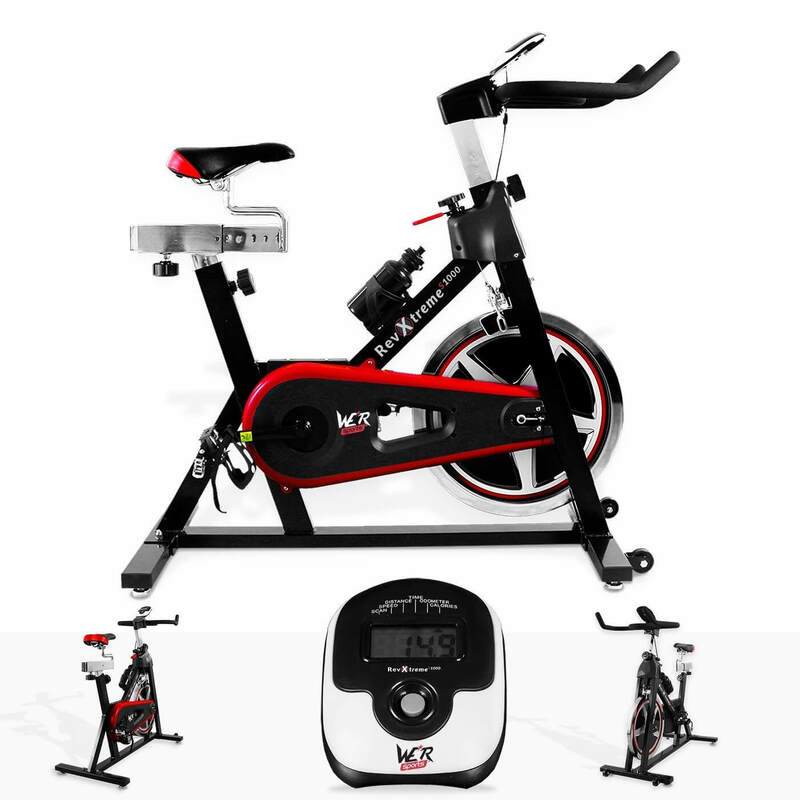 XS Sports 1.6kg Flywheel – Adjustable Resistance – LCD Display – Hand Pulse Sensors – Foldable – 74 x 113 x 41cm – 14kg Affordable VIEW PRICE HERE! Exercise bikes are very popular these days but, to get the best experience, you need to find a magnetic option. This is because these products use magnetic brakes to generate resistance. Traditional breaks, as found in outdoor bicycles, are noisy and uncomfortable – something that is quickly noticeable in a home environment. Fortunately, it doesn’t cost much to find a magnetic trainer and the market is rife with fantastic options. Not sure where to start? Here’s a run through of the top 5 options available today. With a 20 kg flywheel, this training device offers plenty of resistance, ideal for both beginners and more experienced cyclists. The crank system also helps replicate the feel of a traditional bicycle, making for a more natural, intuitive experience. The seat is also adjustable, with 4 horizontal levels and 10 vertical settings, allowing you to get the perfect position. There is also a built in heart rate monitor, which is useful for quickly reading your pulse and certainly comes in useful when undertaking endurance training. As far as its size goes, at 130 x 45 x 134 cm it has a slim size that can fit easily into any room. In short, this bike has been well designed to cater to any and all needs, whether its adjusting the seat or getting the most resistance for the most powerful workouts. As such, the IC400 is well positioned to please experienced and beginner trainers alike. VIEW THE LATEST PRICE NOW! With 8 different resistance settings, you can easily find a level that is comfortable, or push yourself further. Likewise, the digital screen is well position for easy access and provides plenty of useful information. There’s also a built in heart rate monitor. Again, this is useful for monitoring your own progress and is always useful when exercising. As an added practical feature, this device also comes with a bottle rack, so you can always refresh yourself mid-session. This even comes with a matching bottle. At a size of 117 x 64 x 99cm, this is one the smaller and slimmer products. Similarly, at 32 kg, it is not as heavy as its large flywheel and strong design would suggest. To surmise, this is a well designed product that will easily find its place in any home or household. With enough customisable features, as well as some very practical inclusions, this product prides itself on being easy to use. With a 4 kg flywheel, this device can support even the most intense of workouts. This also works well with the crank system, which replicates the feel of a normal bicycle, which helps active cyclists feel familiar at home. Likewise, with 8 resistance settings, anyone can easily find the level that suits their workout the best. This piece of equipment also has hand pulse sensors, so you can check your heart rate mid-session. and adjust accordingly. This information, as well as other useful data, is presented in a clear LCD screen, enabling you to get up to date information throughout your workout. At 25 kg, this is a surprisingly light product. With its powerful flywheel, light design and simple usability, this is a product that few people, if any, can argue with. When you simply want something that works, yet ensures you can get the best workout possible, the Active 110 certainly makes a strong case for itself. With a 4.5kg flywheel, this is one of the most powerful exercise tools available, able to support even the strongest of cyclists. Likewise, this is supported by 8 adjustable levels, letting you find the right amount of resistance to compliment your workout. The LCD display is well position and provides clear information on a variety of areas, allowing you to stay informed. The hand pulse sensors, likewise, offer a quick and easy rate to check your pulse. At 90 x 54 x 139 cm, this is a very small and slim design. As such, it has no problem fitting in small rooms or spaces. At 27 kg, it is also much lighter than it looks, making it easy to lift or store away when not in use. All in all, this is another great product that offers high versatility. With adjustable resistance, heart rate monitors and a small size, this product fits into any space but has enough useful tools to please even a dedicated trainer. At 1.6 kg, the flywheel equipped to this product is more than enough for most cyclists and trainers. This is also supported by an adjustable resistance level, as it can easily be moved up and down via the dial. The LCD display is a useful inclusion and readily displays a host of useful data. This is also connected to the hand pulse sensors, which allow you to get a clear, quick reading on your hear rate. This trainer is also designed around an x-frame, which makes it foldable. When you want to put it away, the collapsed form is much smaller and easier to store. When unfolded, it has a size of around 74 x 113 x 41 cm, making it relatively small and easy to place down. Similarly, at 14 kg, this is also one of the lightest cycle machines available. As you can see, there are enough features here to ensure a smooth and enjoyable experience every time. The ability to fold it away, however, is one of its more unique properties, making it useful in situations where other options are simply too big. Whatever your budget or needs are, there is a magnetic bike for you. While this list looks at the best 5 options available today, it’s clear that one product is arguably better than all the rest. 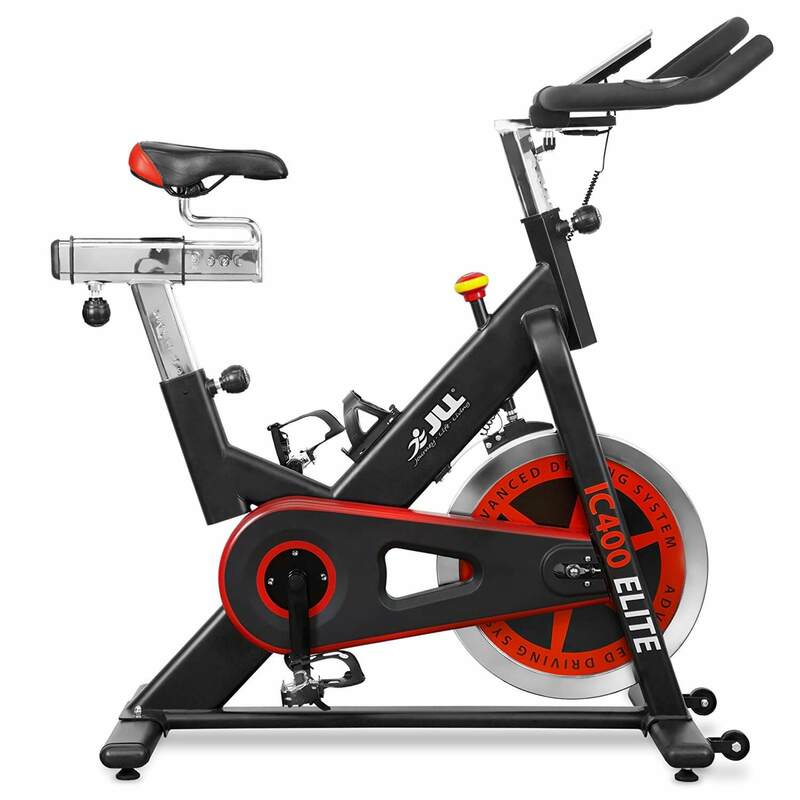 If you’re looking for a device that offers everything you need in a fantastic design, it’s hard to ignore the JLL IC400 Elite Premium Indoor Exercise Bike, as it is sheer value for money.